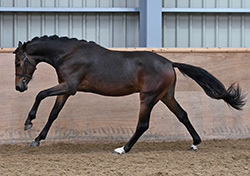 This exciting young stallion is full brother to one of the UK's top dressage ponies, LE Chiffre, who was the highest scoring GB team pony at the 2016 Pony European Championships. 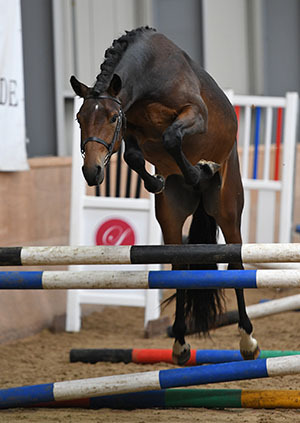 Caesar 171 is graded Elite with the SPSS in recognition of his International competition record as a member of the GB Pony Team that won Silver at the European Championships in Germany in 2000 and the Bronze medal winning team in 2002. Despite his competition career taking precedence for many years, he is also a successful sire with graded sons and daughters in Germany and is damsire of the Reserve Bundeschampion in 2008 & 2009. 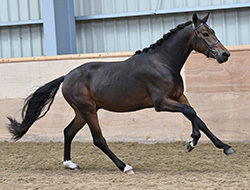 In the UK he has sired other SPSS graded sons, a SPSS graded daughter, 2 pony European Championship Team ponies (LE Chiffre (GB), Ella (IRL)) and 2 further International Dressage ponies (Cruz & Rosewater I Claudius) and the 2013 Young Dressage Pony Champion and 2014 Novice Open National Champion & 2015 National Medium Champion (Cruz). 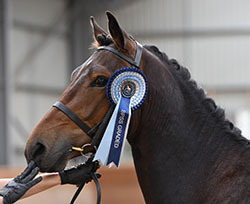 Tiger Lily is a Westfalian mare who graded into the SPSS Head Studbook in 2006 and then, with her first Leamside/Godrics foal, LE Chiffre at foot, was Champion at the 2007 SPSS In-Hand Premium Show. SPSS Elite graded LE Chiffre is now one of the UK's top dressage ponies having been reserve for the British Team at the 2014 Pony Euros, represented GB at the Pony Euros in 2016 and was again selected for the team in 2017. 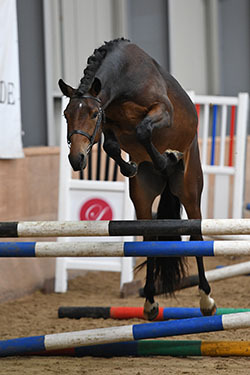 Tiger Lily's dam, Eboli, has classic riding pony and Welsh ancestry from her sire, Nordstar, combined with Thoroughbred and Trakehner from her dam. As a foal, Godrics Cryptonite was assessed by the Oldenburg assessors as being of stallion potential. He graded with the SPSS in the Autumn of his second year. Overall Champion at the 2009 SPSS In-Hand Show. He was backed as a 4 year old and then turned away until 6 weeks before the 2014 SPSS grading when he was brought back into work so he could be presented under saddle. Although he was green on the day, his ability still shone through and the judges particularly liked his conformation, canter and temperament. After the grading, Cryptonite was turned away to mature and he will be lightly backed in 2018 as well as being available at public stud. 2018 will by Cryptonite's first season at stud. With his wonderful paces and outstanding pedigree full of proven bloodlines, Cryptonite is expected to suit a good range of mares. He is also an idea choice for those looking to breed athletic and talented Sports Ponies or to "downsize" horse mares without compromising on quality.